This week, I was really fortuante to spend time with Wade Gilbert as part of a discussion group at University of QLD. 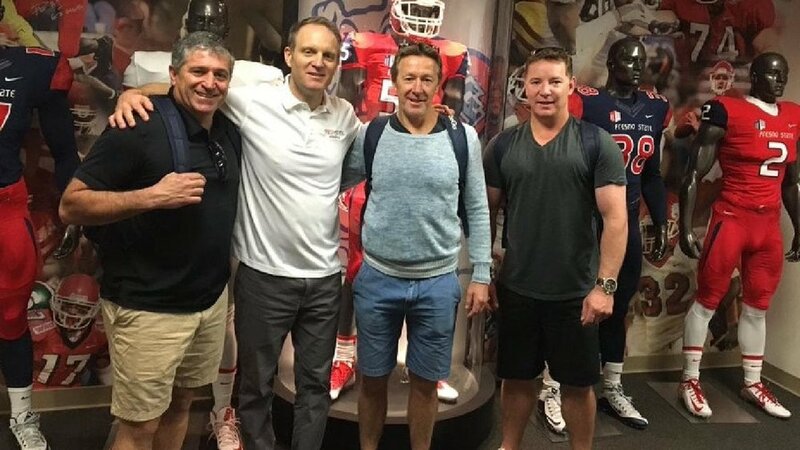 Canadian coaching guru Wade Gilbert is in this country as a guest of Cricket Australia; as well as speaking to CA’s coaches and leaders, Gilbert has spent time in recent days with NRL clubs Melbourne, South Sydney, Cronulla and North Queensland. He has also visited AFL clubs Collingwood, North Melbourne, Richmond and the Brisbane Lions. Having previously met Gilbet at ICCE Conference in Liverpool (an admittedly nerve wracking experience as he chaired my research presentation!! ), I was keen to spend some time with him while on Australian shores. Gilbert, currently Professor at Fresno State University in California, started by discussing where he was from and his journey to where he is now, outlining how fortunate what he has been doing being in "the right place at the right time". He has worked within academic research circles with such people such as Jean Cote, Pierre Trudel and Cliff Mallett and worked alongside legendary coaches such as Coach Wooden among others, gathering a wealth of knowledge along the way. He has recently been involved in creating the USOC Quality Coaching Framework, which provides an overarching set of principles that is designed to inform how to coach most effectively. The USOC QCF is a evidence-based resource that establishes a common language and principles of quality coaching for all those working in Team USA coaching contexts. He highlighted the running joke of how a Canadian has been used to make US Coaches better but no one can dispute his reputation in coaching circles. Gilbert started to discuss further areas he considers of growing importance within coaching, one of them being coach wellness and ability to perform. He discussed how he has seen an increase in importance of coach's health and wellbeing with increased pressure to perform, increasing turnover of coaches and staff and good coaching practices being overlooked for result driven industry. He echoed Coach Wooden's saying of "never mistake activity for achievement", expressing how busy coaches made themselves appear and focusing on the results or the product over the process, an area I have discussed previously towards coaches adopting a growth mindset. He talked about the coach's ability to perform in different moments, preparing to win training sessions, meetings and matches with the correct mindset and how increasingly important mindfulness tactics such as active breathing, imagery and meditation are to catch and create energy for people to learn. Highlighting the number of coaches within NBA this year taking a medical leave of absence, he highlighted another area of importance and which I have previously addressed of coach burnout. Coach like athlete burnout results from “chronically frustrated or unfulfilled basic physiological needs” (Cresswell, 2006) and “denotes a negative emotional reaction to sport participation” (Gustafsson, Kenttä, Hassmén, & Lundqvist, 2007). Coaches recognising themselves as performers should again increase awareness towards well-being to portray the clear purpose and passion towards their program, understanding your players and offering what is required in meeting their needs. Coaches need to have the physical and mental capacity to create environments and atmospheres where all involved are testing and pushing by training to improve themselves as opposed to training to prove themselves. Cliff Mallett, Steven Rynne and Gilbert discusses amongst the group high performing and serial successful coaches. The highlighted areas such as continually striving to improve and continue learning, never happy or satisfied and always looking to improve the process while adopting transformational leadership styles. Gilbert highlighted areas I have recently discussed looking how coaching success stems around the competence, confidence, connection and character developed with the athlete as a result of the coach-player relations yet coach adopted transformational leadership styles would result in positive intrinsic motivations and increased athlete effort. Wade addressed that you "aren't selling your program; meet them at their needs and better understand through connection". Gilbert again discussed with the group regarding coaching being navigating moments and this included defining and recognising moments of leadership. Offering an example used from time with Melbourne Storm, when asking players what does leadership look like to them and asking for examples or moments in action on and away from the field each day, he ensured examples offered where really highlighted and applauded when offered. Gibert touched on other apsects discussed in his Australian trip with coaches including developing leadership groups, team communication and athlete readiness, all part of your coaching domain. I have previously heard Gilbert refer to coaches as "environmental engineers" suggesting creating an atmosphere where coaches both continue to learn and encourage learning. Gilbert strengthened this statement by saying how learning aids meaning and context while being intrinsically motivating to learn. He reiterated the saying "becoming is better than being" which enforces the belief of the great that you never "become" a great coach or achieve mastery in playing; you focus on the importance of the individual and relationships and focus on how and why to keep getting better. Thanks to Cliff Mallett and Steven Rynne of UQ for hosting the forum and Darren Holder of Cricket Australia for incorporating as part of Wade Gilbert's trip to Australia.